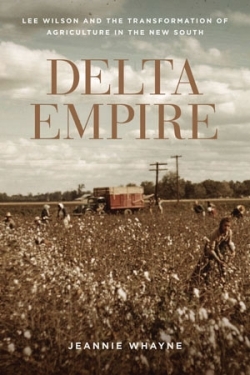 In Delta Empire, University of Arkansas historian Jeannie Whayne uses the history of a powerful plantation owner in the Arkansas Delta to recount the evolution of southern agriculture from the late 19th century through World War II. In 1870, Robert E. “Lee” Wilson inherited 400 acres of land in Mississippi County, Arkansas. Wilson transformed the landscape. He drained tens of thousands of acres of land, in order to create a vast agricultural empire, a lumber operation and cotton plantation. Wilson employed the tenancy and sharecropping system to his advantage while earning a reputation for fair treatment of laborers, a reputation Whayne suggests was not entirely deserved. Delta Empire traces the transition from the labor-intensive sharecropping and tenancy system to the capital-intensive plantations of the post-World War II era.